Samsung is a brand that is well known for providing some of the best smartphones and HDTVs in the market. Through the years, this iconic name has decided to reach out to other products as well such as air conditioners. At present, Samsung offers a wide range of split air conditioners that not only boast of high quality performance but also channels its signature sleek design. This article will feature a summary of Samsung air conditioner reviews on their split air conditioner units. One of the biggest and strongest selling points of a Samsung split air conditioner is its ‘eco-friendly’ feature. The brand has decided to design their brand thinking of air and water conservation, less power usage, and using parts that can be globally recycled. It also uses a R-410a refrigerant which is an eco-friendly one and reduces air pollutants and the usage of material with high global warming potential or GWP. In terms of technology, Samsung’s split air conditioner units boast of an S-Plasma Ion technology. Their unit which comes with a feature called ‘Virus Doctor’ has the S-Plasma ion which functions by creating oxygen and hydrogen ions. These ions combine with harmful ions present in the air like OH radical, bacteria, and viruses and convert them into water vapor. Now when it comes to its cooling capabilities, Samsung can be considered as a little more above average. Its split air conditioner units come with two features namely the maximum (turbo) cooling and even cooling function. The turbo cooling option enables the device to run at a maximum speed of 30 minutes and then cools down afterwards. The even cooling control, on the other hand, works by distributing the air evenly in the room. One good feature of this air conditioner is that they assess the existing humidity and temperature in the room and self-adjusts in order to provide the most pleasing cooling environment in the area. This feature can be enabled when these air conditioners are set on automatic mode. It even helps in the reducing of energy usage as well. 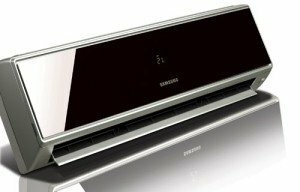 Now with its looks, there is no doubt that Samsung also applies the sleek designs they are so well known for in their air conditioners. They offer units in a number of tonnage capacity and BEE Star ratings. They truly stand out from the usual pack of split air conditioners with its colored body (usually maroon)and very stream lined design. In terms of its cons, there are Samsung air conditioner reviews that complain about the brand providing bad customer service. Some people say that they have to constantly remind their service center about their request for repair and that representatives offer false and repetitive excuses whenever they fail to provide technicians. There were even feedbacks from customers complaining about their unit breaking down a couple more times despite of being repaired by service engineers from the brand. In summary, Samsung’s split air conditioners can be considered above average in terms of performance, design, and features. Still, we cannot give a full okay to them because they weren’t able to meet the customer service needs of their users which is a very important aspect in air conditioners.